Caron’s refrigerated chambers are ideal for many long-term refrigerated applications. With a range of 5 to +70C (0C optional), tight performance tolerances, and a choice of capacities ranging from 10 to 75 cu.ft, Caron’s chambers are ideal for long-term product storage and conditioning, in fields from pharmaceutical to aviation. All units are easy to install, use, and maintain, with unique resource-responsible technologies. Caron’s heated and heat/RH chambers are ideal for many elevated storage and conditioning applications. With a range of ambient plus 10C to 70C, available controlled humidification, and tight performance tolerances, Caron’s chambers are ideal for long-term product, packaging, and materials testing, in fields from pharmaceutical to aviation. All units are easy to install, use, and maintain, and feature unique resource-responsible technologies. 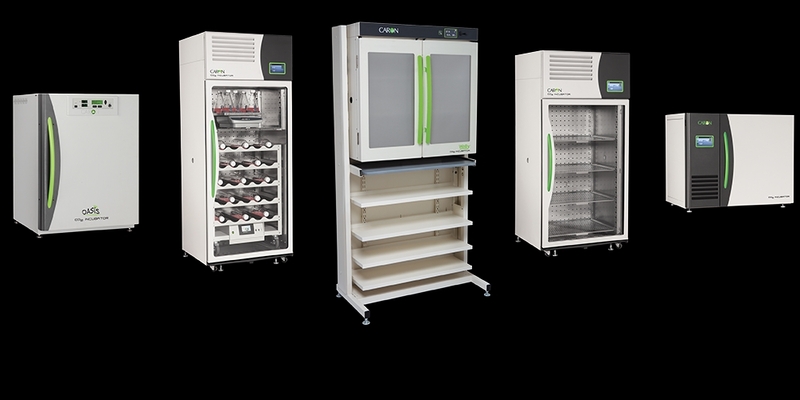 Caron’s CO2 incubators are available in a wide range of sizes, all of which share something in common: they’re uniquely different and better than competing products. From the revolutionary array of space efficiency and culture quality improvements in the Wally stackable, to the easy-install design and easy-clean interior of the reach-in line, Caron specializes in offering valuable benefits that you can’t find anywhere else. Caron’s Wally is the the first clean-slate approach to CO2 incubators. Revolutionary slim profile design saves valuable floor space, and guarantees that all internal volume is usable space. Assured culture quality with ISO5 air filtration, and available 2 hour dry H2O2 chamber sterilization. Patented GelJacket thermal protection, with the temperature maintenance after power loss of a water jacket, but with none of the maintenance hassles. Wally is uniquely easy to use, with hands-free door opening, and a big bright touchscreen display with intuitive breadcrumb navigation. Caron’s Wally; offering valuable benefits that you can’t find anywhere else.